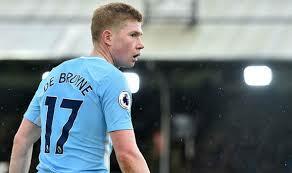 Manchester City midfielder, Kevin De Bruyne has said he deserves to be named Footballer of the Year, despite Mo Salah’s impressive 37-goal campaign. De Bruyne himself has scored 11 goals and provided 20 assists, as Pep Guardiola’s men continue their march to the league title. And the Belgium international reckons he has done enough to be recognised by his fellow players over his Liverpool rival. “I am very happy with myself, I am very pleased with how I have played. I didn’t expect to be this good this season. “If I get it, it would be nice for the team and for me. I think there is almost no game where my standard has dropped, so I have been constant, and I am happy with myself. “To maintain the level the amount of games I have played, the amount of minutes, I am pleased with that,” he said. De Bruyne, however, admits that he faces a stiff challenge from the little winger. “Salah has a remarkable goalscoring run, and he plays very well like an inside forward type of role. This season he has been incredible,” he added.